Pelagic fish accumulate and travel along fronts, or regions of abrupt changes in temperature and chlorophyll. We have developed a method to identify these fronts in both temperature and chlorophyll. 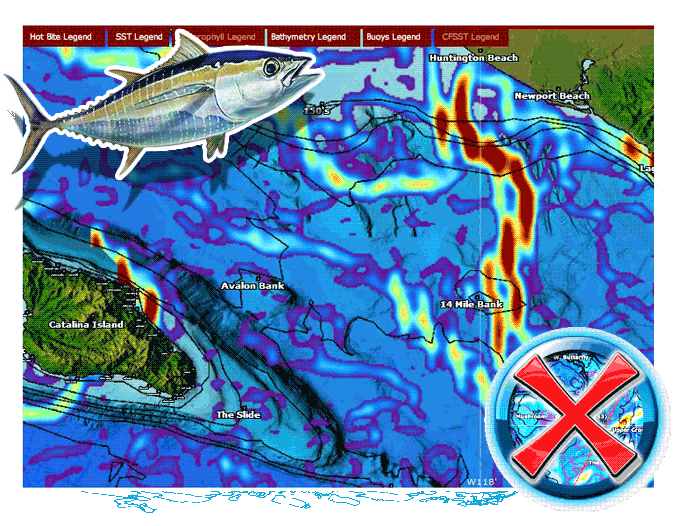 Bite Zone maps show you where different water masses touch and fish are likely to accumulate. Not all Bite Zones will hold fish, but in regions where pelagic fish travel and feed, our Bite Zone maps help you decide where to concentrate your fishing effort. Our exclusive Bite Zone maps watch temperature breaks for several days and highlight the areas with the most current activity. More current equals more bait. Fish never stray too far from the “fridge”. Use this chart along with the Hot Bite fish icons to tell which current the fish are favoring, cutting down the hunting time and putting more fish on the boat.